There are many joys in raising our English Cream Golden Retriever puppies, one of which is watching as they begin to explore the world beyond the watchful eye of their momma. Day by day, week by week, the changes in these puppies have been astonishing and rapid. Zivas’ pups were born in late November, and by their eighth week of life, our world was a glorious winter white. 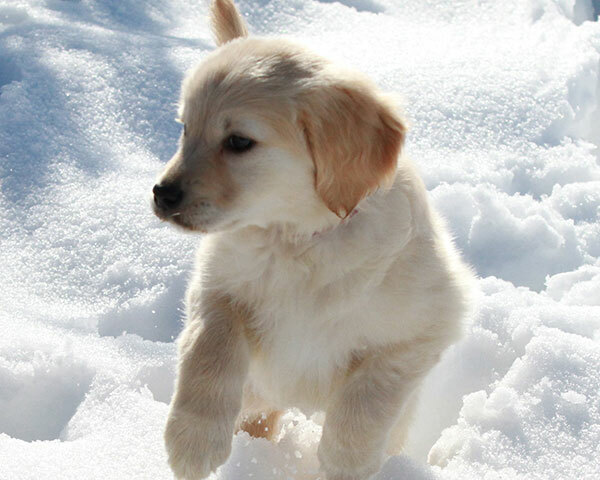 The creamy white coat of our babies was often framed by the sharpest blue sky and glistening winter white snow. The coyote song and enduring tales of the Canadian Grey wolves that live in our mountains bear witness to the peace that is ours and this life that we share with our Golden Retrievers. Comfort comes in the bird’s winter song, and the roar of the rushing water in the nearby stream turned river. Our mountain companions are many and being present at the moments of their discovery for our puppies has been such a pure, sweet pleasure. Romping and jumping are all of a sudden halted. The Golden Retriever stance that is built into their little bodies by the generations that precede them takes over. Heads lift, tails straighten, one paw becomes suspended in mid-stride as their ears rise to the new sounds that have yet to become familiar to them. Let me now introduce our English Cream Golden Retriever puppy available for adoption, Tiny Dancer. She is a sweet little lady that has a remarkable capacity for fun in her very feminine frame. If you are quick and willing to study her carefully, you will be there at the moment you see the sparkle in her eye as she conspires to engage her mother in a round of tail biting. Her play is a “dance” that has been so different from her litter mates’ rompings and has been the inspiration for her name. Fortunate is the family that will bring her home to be with them!